ANIL AGARWAL: The issues we are here to discuss today are as relevant for the industry as for the environment. I hope there will be a free and frank discussion. The paper industry is critically important for promoting literacy and communication. However, the paper consumption pattern does not show that the industry is meeting its social goals. Some 50 per cent of the paper consumed is accounted for by industry. The use of paper for cultural purposes - printing and writing - is shrinking. It is obvious that paper consumption is not moving in the appropriate direction. Two, the industry is going through a critical period. A lot of companies run obsolete and energy-inefficient plants. Studies by the Industrial Credit and Investment Corporation of India, Bureau of Industrial Costs and Prices, and other organisations, show them to be very polluting. The paper industry has a poor investment level in research and development (R&D). Three, there is a raw materials crisis. The industry is moving towards imported pulp, paddy residues, waste paper and, in the past few years, bagasse. Alternative methods need to be explored. Paper is hardly recycled in India for papermaking. The belief that India is the greatest country in terms of recycling is a lie. Four, quality paper needs raw materials with a high yield of long fibres. There could be a shortfall of 4.65 million tonnes (mt) of wood by AD 2015, if one assumes that the demand for wood remains constant at the current level of 1.23 mt. Potentially, however, there is a lot of land to grow wood. Five, the industry has had a bad track record in terms of managing forests. During the '50s and '60s, the government believed that forests were inexhaustible. Forests were given out to industry on long-term contracts at abysmally low prices. It was industry that initiated deforestation and land degradation. In the '70s, as environmental awareness grew, the government began to realise the importance of forests. It reneged on those contracts and increased wood and bamboo prices.' Around the same time, World Bank- inspired social forestry programmes began to be targeted to meet the poor people's fuel and fodder needs. Their 3 components were strip plantations, farm forestry and village woodlots. Through the '80s, village woodlots fared miserably, while strip plantations were moderately successful. But farm forestry was a tremendous success. According to data collected by N C Saxena, 10 billion trees were planted in farm forests between 1980-1988, over roughly 5 million hectares (mha) of land; about 60 per cent of this was eucalyptus trees. Taking into account survival rates, this gives us 7 million tonnes (mt) of pulpwood annually. Unfortunately, the government's decision in the mid-'80s to allow cheap pulp imports forced the farmers to panic-sell the entire produce. These imports were first allowed during Rajiv Gandhi's tenure. It was argued in Parliament that we must save our forests, and so we must allow pulp import. The pulpwood market went out of the farmers' hands, and they were left only with the urban fuelwood market. Growing tree crops, thus, became unremunerative. Many farmers pulled out growing seedlings. Today, industry is strongly demanding captive plantations on state forest lands. Indian industry must be profitable and competitive, but it must also meet the social objectives of generating employment and reducing poverty. Industry must do things in a way that helps expand the domestic market. Ecological objectives demand that state forest lands grow genetically diverse species. And that monocultures be restricted to farmlands. Also, there is no reason to believe that genetically diverse regeneration on state forest lands - through Joint Forest Management (JFM) or other kinds of participatory mechanisms involving local people in for" margement - can't meet some of industry's pulpwood needs. Captive plantations on state forest lands will destroy the wood market of the farmers; and a market is absolutely essential if we want poor people to grow wood. I am sure that industry will point to some problems here; but none of these is unsolvable. To my mind, farm forestry, especially by poor farmers on poor land, is the most appropriate approach to meet the industry's needs, both socially and ecologically. DULEEP MATTHAI: It is important to remember that the demand for captive plantations is also coming from other industrial sectors, like tea and coffee plantations, horticultural crops, and so on, which are concerned with accessing raw materials from forest areas. I believe that the availability of paper is going to be more difficult and costlier in the future. I would urge the paper industry to look at alternatives: bagasse and agricultural waste have enormous scope. Today, about 30-40 per cent of paper is made from agricultural waste. PIARELAL: Let me start with the status of India's land resources. Some 130 mh a-, or 40 per cent of India's geographic area, Lomprise degraded forests and wastelands, and need urgent reclamation and reforestation. This is true also of 31 mha of recorded forest area. The gap between demand and availability of fodder, fuelwood, timber and industrial wood is continuou,r1dy growing. Figures supplied by the ministry of rural development show large deficits in the fields of fuel-wood, dry fodder and green fodder. Even industrial timber, whic 1i has a comparatively insignificant demand, will suffer a 15 million cubic metre (mcm) deficit. According to the Food and Agricultural Organization's (FAO) estimates, the demand for firewood and charcoal in AD 2010 will be 344 mcm - and only 36 mcm for industrial roundwood and 33 mcm. for sawn timber. The figure is insignificant for paper and paperboard. These demands just can't be met from our shrinking national forest resources. There is a need for technology-based restoration of the green cover through plantations. The truth is that not even I mha have been planted under social forestrv schemes of the government, although we hear that billions of seedlings were planted. Social forestry failed to meet the farmers' expectations because of the poor quality of land and faulty silvicultural practices. Farm forestry can only meet a part of the raw material demands- Importing pulp will mean foreign exchange outflow - Rs 9,920 crores by AD 2010. All the major indirect developmental benefits from reforestation will then go to other countries. It will take 26 years to reclaim 130 mha of degraded wastelands, at the rate of 5 mha a year, and will cost a colossa'I Rs 3,90,000 crore at current prices, at the rate of Rs 30,000 per hectare. The government alone cannot manage this task. It must involve the corporate sector, through innovative policy changes, and by making land available for industry. By investing the funds that India would otherwise spend on pulp import in reforestation, all the degraded forest-areas can be converted to productive plantations in 10 to 12 years. The country's entire pulpwood needs, and bulk of its firewood needs, can be met from this. R RAJAMANI: Piarelal says that not even 1 mha has been planted. Where does he get this figure from? PIARELAL: If that figure is incorrect, I stand corrected. But mere planting is meaningless unless the trees survive. S S RIZVI: I feel that we are being derogatory about our own efforts. A K MUKHERJEE: The position in the 7th Plan is that nearly 8.3 mha were planted. Unfortunately, the Planning Commission has never been kind to forestry. So far, we have been able to do nearly 1 mha of block plantations, and 6-7 mha through seedling distribution. Reports talk of 60-70 per cent survival rate in block plantations. Seedling distribution results have not been monitored, but their survival rate varies from 10 to 40 per cent. The people and NGOs did a tremendous job, but mainly for fuelwood. There was also a slight lack of planning, in the sense that fertile land was more available in Punjab and Haryana, where there is hardly any paper industry. RAJ CHAURASIA: I will definitely say that Haryana has a large number of industries based on wood, but it doesn't have large forests. MADHU SARIN: I had worked closely with the Haryana Forest Department when the eucalyptus crisis started, in the '80s, due to the collapse of the market. At the height of the crisis, the Principal Chief Conservator of Forests refused to buy wood from the people on the ground that it was of very poor quality. Now, we hear the demand for forest land. Piarelal's remark, that social forestry failed because the genetic stock, supervision and the scientific basis of plantation was poor, is a sweeping one. My question is: who was doing the supervision? Having worked at the grassroots level with villagers, who regenerate totally degraded forests with no inputs from anybody, I find that we are talking as if there is no third option. Productivity has to be increased. But not without considering the people most directly affected by it. Every change in land-use is going to mean displacement of present users. Piarelal also said one could stop encroachment by providing fuelwood. But people don't encroach upon forests just for fuelwood, but for their entire livelihood. WALTER FERNANDES: I think industry should ask itself if it is willing to take land which the people do not need. For example, Rajasthan offered 25,000 ha of land which, as Piarelal said, could have been regenerated at the phenomenal cost of Rs 30,000 per ha. Industry did not take that land. Similarly, in Uttar Pradesh. Our studies in Madhya Pradesh and Orissa show that 60 per cent of the wood is used by various industries, not by the people. This is information from industry sources and the Forest Department (FD). N C SAXENA: I would really recommend giving over desert lands, wastelands and usar (saline) lands to the industry. But experience shows that when barren land was offied, it was declined. Industry imported timber, instead. I suspect that in the name of barren land, good quality forest land will be given to industry. Degraded lands are vot available in continuous patches. These lands are under tremendous biotic pressure. I agree with my industry friends, that unless we tackle biotic pressure, no amount of plantation can succeed. But biotic pressure can be handled in only 2 ways: either you do um, or you hire mafia gangs who can use their guns. There are 3 arguments against giving forest land to industry. One, the tribals are dependent on these. Then, there is an obvious ecological objection. But there is also an economic argument. If farm forestry had not been successful, then perhaps leasing forest lands to industry would have been acceptable. But it was successful, and there were overall social gains from it. If we now ignore it and give land to industry, farmers will lose heavily. PIARELAL: Let us not make this a debate on industrialists versus others. Let us debate the issue as a national problem. Regarding the question of why industry is not taking certain lands which are being offered, I would say that it is better to regenerate land which still has top soil left, before reclaiming the utterly degraded lands. Besides, if money is to be invested, it must bring reasonable returns. S R HIREMATH: What I find most unbelievable is that there has so far been no widespread debate on the issue. I have yet to see a document from the paper industry articulating its stand, other than what we saw today. In Karnataka 25,000 acres of forest land were given to a joint sector company, the Karnataka Pulpwood Limited (KPL), a combine of the Birla- owned Harihar Polyfibres and the Karnataka Forest Development Corporation. Surprisingly, in Kusnur village, the gomal, or revenue land, which was not given to KPL, was just bulldozed. This shows that industry wanted to have complete control. The Conservator documented all this, and wrote to the government. But even after 6 years, nothing has emerged. I want to mention a few points which Kamal Nath, minister of environment and forests, and people in the industry are putting forth. First, it is said that only "severely degraded lands" will be given to industry. I think this is a big lie. The home truth is that the kind oflands industry wants is precisely the ones the poor are most dependent upon. Also, let me say that planting eucalyptus trees does not help generate employment. One study shows that migration actually increased in such areas, because people making baskets, leaf-plates or pickles lost their raw material sources when eucalyptus plantations were established. It is possible to involve people in afforestation projects. There is a Rs 6 crore project, financed by the National Wasteland Development Board, near my village, involving the local people. Miracles are happening there. So, there is today a very effective alternative which did not exist in 1984 - that is, joint forest management. DULEEP MATTHAI: I believe that ecological security is the foundation stone of sustainable development, which means ensuring that the life-support systems are optimised. Of these, water faces the greatest threat today. The practical approach to this is to determine how we can optimise on the monsoons and the water that it produces. Today, 80 per cent of it goes to the sea. Then, most of us know very little about the dynamics of natural ecosystems. Left to itself, nature,,has the most extraordinary way of restoring naturaTbiomass coverage to even utterly degraded forest areas. Industry has a serious responsibility in ensuring sustainable development. KAMLA CHOWDHRY: We must look at this as a national problem. But there are really 2 nations. One seems to have seen the tribal areas. The other is more urbanised and can approach the government much better. It knows how to talk business. The problem really is to decide, not as two nations but as one, what the national priorities are. If our priorities are to upgrade the poor, then the industry's strategy will have to be different from the one followed in the North. ANIL AGARWAL: I'm not entirely sure of that. I think we respect the industry's raw material needs, but weiwant it to meet its needs from the farmers. Farm 'forestry may- even be cheaper compared to captive plantations. KAMLA CHOWDHRY: Yes, if the first priority for the industry is to meet the needs of the poor people, then it will come to farm forestry. C H HANUMANTHA RAO: I think industrial interests and those of the people can be reconciled, although, as Kamla Chowdhry pointed out, there are two nations, in a sense. Industry's mainl problem is ensuring a stable supply of raw materi@ ,Is, and not so much the cost. Industry is willing to achieve this even at a high social cost. The penhectare cost for captive plantation is going to be 4ery high, as compared to the on-farm per-hectare'cost. Further, the social cost is going to be much higher than for farm forestry. As far as degraded forest lands are concerned, the cabinet note, _prepared by the rdinistry of environment and forist" is supposed to have raised the issue of collaborations between industry and the state-owned forest development corporations (FDCS). Can't the ministry add collaboration -Aith the farmers? They can be given land on a lease basis. Industry can participate by providing tech- nology and finance. In lieu of that, industry is assured of a stable supply. R C RASTOGI: The All India Small Paper Mills Association has 138 mills based on wastepaper. I have data which indicates that only 40 per cent of the raw materials needed by industry comes from the forest. The Phoenix Paper Mills in Thailand uses only bamboo as raw material, sourced entirely from farm forestry. They use short fibre, and yet, the paper they produce is among the best in the world. Today we have a lot of short fibre available in the country. This can be diverted to the paper industry, reducing the burden on forests. Till the '60s, there was no paper mill in India based on agrowaste and wastepaper as raw material. Today, 60 per cent of the paper in India comes from this sector. We also have to make our people aware about the need to cut down on paper wastage, change our lifestyles, as people are doing in the Western dountries. MOHAN HIRABAI HIRALAL: The main issue is to protect the basis of life, to recreate what has been destroyed, to conserve what remains, and to find the means of doing so. The debate has to be conducted in this context. The 1988 Forest Policy, which sought to prioritise the life support systems of the forestdwellers through the Panchayati Raj system, was the first hesitant step towards the right end. Then, JFM showed that state power alone cannot achieve social objectives. JI'm had many flaws, but it was a step in the right direction. These processes will now be reversed if the present proposal is accepted. R RAjAmANI: The 1988 Forest Policy clearly held that there are 2 things in our country which are not negotiable. One is our natural resource base, the ecological base; the second is the poor people dependent on that. What, then, is the problem? The problem arises from a feeling of diffidence in the entrepreneurial community. But a dynamic section of the paper industry had demonstrated, after the Forest Policy was announced, what wonders can be achieved through tie-ups with farmers. There are only two things lacking: one, we must be able to double the governmental outlay on forestry; and two, we must have a proper procurement pricing mechanism for all forest products. These two things are implicit in the Forest Policy, and should have been done by now. Lastly, I would appeal to my friends in the industry not to appear as if they are against the interests of the poor. For God's sake, don't let that impression gather ground. UDAYAN BANNERJEE: I personally feel that good forest land should not be given to industry, because they have so many other options. Even the Forest Policy says that industry should not be given forest land for captive plantation purposes. It should be don6 by the state government or the Forest Developmenf Corporation. Let us not be rigid. All of us want degraded forest land to be greened. Who does it is immaterial. Let us look at the alternatives, and then, if necessary, we may come to this degraded land. That too, after ensuring ecological sustainability. BHIM SINGH: At WIMCO we tried to stick to the ideal of procuring raw materials from the farmers. But there were problems. Keeping in mind our social goals, wimco started a scheme with the National Bank for Agricultural and Rural Development (NABARD). We introduced the poplar variety of trees to the farmers. Thus, by 1984, agro-farm forestry in its best sense took off. We had 17.5 million trees growing on farmland. This was to benefit 300 other small and large industries. But unfortunately, our friends in the other wood-based industries are taking the wood away, without having invested any money on it. I think there are 4 types of people involved in the issue of plantations: entrepreneurs, NGOs, owners and the government. I think we should A pool our resources. Kamla Chowdhry mentioned that some of you have travelled to villages and know the people and the country well. That is a very big resource. We know the technology. Instead of blaming each other, I think our efforts should go hand in hand. We should work together to develop the villages. We-have 130 mha of land to develop. P V MEHTA: Only one particular organisation cannot solve the plantation problem. What is wrong if industry is able to solve its raw materials problem, and increase the green coverage of the country, with the helpbfthe forest department and the local people? Then there are problems in investing in farms, like the one faced by wimco. They spent money on farm forestry, and the farmers sold the wood to the plywood industry, because the latter paid better prices. If the plywood industry helps the farmers with farm forestry, the farmers sell th@ wood to the paper industry, because compared to the plywood industry the latter pays better prices. The crux of the problem is that we are talking as accuser and accused. Anil Agarwal says that captive plantations on degraded forest land is not correct. We are starting the discussion with a closed I'll", mind ... this is not correct. Farm forestry as a concept is fine. But this alone is inot going to solve the problem. There is a basic lack of trust in the industry. ANIL AGARWAL: The issue is not one of trust. We respect your needs. But there are different strategies to meet your requirements. We do not believ6 t4at captive plantation is the only answer, or the best answer. Where is the evidence that farm forestry cannot meet all your needs? Potentially, 30 to 40 million hectares of degraded private land can be brought under tree cover. Why cannot these lands meet all your current and future needs? Also, you may say that the 2.5 million hectares proposed to be given to industry is small. But even if you give a rent value of Rs 1,200 per hectare per year, it comes to a subsidy of Rs 300 crore a year. If you take Rs 400 for each tonne of wood produced on 2.5 million hectares, taking I tonne of output per hectare, you get a Rs 100 crore worth of annual production. This is a huge subsidy. So where are the figures on your side to defend this sort of thing? C H HANUMANTHA RAO: I hear the paper industry saying that sourcing its raw materials from farm forestry results in high cost, unstable or unreliable supply and bad quality of wood. Let's keep aside, for the moment, issues like environment, participation and national endeavour. Among the 3 issues the industry is facing, how does it rate them, so that we can find a solution and arrive at a consensus? N C SAXENA: There is a growing consensus that industry is not interested in barren or degraded land. The government also says there is no question of leasing land to industry. But the Orissa government's proposal says that industry would appoint project managers who would be solely responsible for implementation and other day-to-day work. The Arunachal government's proposal says that the right of surface utilisation will be given to industry. So who are we fooling? MOHAN HIRABAI HIRALAL: I want to say that whenever we talk of raw materials, we should remember that there are 2 kinds of forest-based industries: those in which whole trees or plants have to be cut; and those which are based on non-wood forest produce. The challenge of using these non-wood raw materials as a base for industry has not even been accepted by the industrial group. How can they talk about a raw material crisis? SAMAR SINGH: We adopted the forest policy only in 1988. Are we not being unfair to it by wanting to change it in so short a time? Already, there has been growth in the field of farm forestry, or agro-forestry, and also in the field ofparticipation of local communities in managing degraded forests. We have experience of 10- 15 'years. This experience must be allowed to build up. The fault lies with everybody - those provoking the debate and those encouraging it. This major policy change cannot be brought about in the manner in which it is being considered. Every now and then, this question is raised of 130 mha of degraded land lying around, and the need for doing something about it. If anybody could kindly show me such large chunks of land which are not already committed to some kind of land use, I think we can certainly go on with the debate. But even in desert areas, there is recorded land use. So, are we not trying to reopen an issue that has already been settled by the 1988 Forest Policy? What is the debate about, then? V S ESWARAN: The 1988 Forest Policy had 2 cornerstones: ecological security and the commitment to the management of the forest for the needs of the local people. If we are going to stick by them, we will have to examine very carefully the proposition of the industry or the FDC, or some other forest department entering the forest through the back- door. In fact, this has to be looked at in the total context of the Forest Policy and its main objectives. As far as my information goes, the requirements of, and pressures from, the industry had a lot to do with the delay in the finalisation of the 1988 Policy. The idea of giving forest land to industry is a step derogatory to the Policy. A C CHAUBEY: We will ensure that mixed plantation takes place, and industry will not have the only say. The final decision lies with the Forest Department. and nok the industry. I agree that a planted forest is not ideal for biodiversity, but then, it is better to have something than nothing at all. N C SAXENA: The Punjab, Rajasthan and Orissa governments have all asked for reserved land. A C CHAUBEY: But the government of India did not give it to them. Industry is only going to provide the funds. They can't dictate terms. 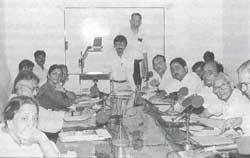 Both Mukherjee (as Inspector General of Forests) and Rajamani (as environment secretary), cleared and signed the proposal. Rajamani can't suddenly deny his role in it just because he is now retired. R RAJAMANI: I want to make a clarification. It is difficult for a pensioner, who's just retired for a year, to breach official secrets. Chaubey has put me in a veiry delicate situation. I want to say clearly that what I have said in this meeting is with a totally clear conscience, and not at all inconsistent with what I have done in office. PIARELAL: What really pains me is that industry is being treated as anti-poor. By no stretch of imagination is it so. I don't think our agricultural lands can provide more job opportunities unless we rehabilitate some of the degraded land. The first issue is that of the, 1988 Policy. But the National Commission on Nigriculture had recommended that production, forestry (that is, plantations) and conservation are n4t mutually exclusive, and the needs of the industry, the nation as well as those of the local people must be met from forest resources. The crucial issue is that of our ultimate ecological security. I think everyone, including the industry, should join hands in ensuring that. RAI CHAURASIA: During the interaction we had with the forest ministry, it was pointedly told to us that even if the so-called arrangement is allowed, we will have to put in all the money, but we will Ft no, ownership. We will have to mortgage our own existing resources to raise funds for the programme, a condition which does not prevail any-where else in the world. A K MUKHERJEE: With the signing of the GATT, We have to understand the need to be competitive. We have to talk of forestry on an economical scale. If we are talking economics, we have to open up the forests. And it is only industry which can ensure production and economies of scale. PIARELAL: We are importing Rs 1,500 crore worth of pulp and paper. I feel that if the nation starts investing the same amount in plantations ... whoever does it ... about 60-70 per cent will go to the poorest of the poor as wages. ANIL AGARWAL: You need not necessarily give them wages. You can also let them grow trees and sell them. MOHAN HIRABAI HIRALAL: No land is wasteland. The government's assurances of protecting the tribals' rights cannot bear fruit unless there is knowledge of these rights. While laying down these rights, it is repeatedly forgotten that while fodder and fuel needs are sometimes'taken into consideration, food, which is a major product obtained from the forests, has never been honestly addressed. Third, if the government is really concerned about the tribal rights, how can they talk about them without considering the recommendations of the Bhuria Committee it had appointed? If these are not taken into consideration, it is against democratic ethics. WALTER FERNANDES: I'm disappointed, because the impression being given is that the debate is just on farm forestry versus captive plantations. I do not think that this has been our position. I think we began by saying we have to combine profitability with social justice, and the whole search has been precisely in that direction. Where do the poor of the country stand in the debate? We have to find alternatives that are acceptable to industry as well as to the poor. We have to think of an alternate strategy of land management, raw material marketing and production, that puts those two together. PIARELAL: There is already a successful model working in Karnataka. The only difference is that it is a state-owned paper mill. The Mysore Paper Mills (MPL) has captive plantations on degraded forest land, both in dry and wet zones, and I don't see any conflict of interests between the poor and the industry there. ANIL AGARWAL: I don't think so. The facts are otherwise. I will call upon my colleague, who visited the (MPL) plantation, to elaborate on this. ANUMITA ROYCHOWDHURY: I want to make two comments. First, the industry is creating such a din over the so-called shortage of raw materials, where as the fact is that there is gross under utilisation of the available resources. The Forest Research Institute, Dehradun, has identified about 72 species of pulpwood, but right now the mills use only about 5 major species and mixed hardwood, which comprise less than 10 per cent of the total raw material's used. Sometime ago, the Maharashtra FDc estimated that pulpable wood constitutes about 40 per cent ofthe total hardwood produced in the state. But those mills which have control over local resources and assured raw mate- rials supply rejected these as "unpulpable". But the MFDc also found that the same "unpulpable" wood is readily accepted by mills facing a raw materials problem. The reason behind this underutilisation is that the machinery in these mills are designed to handle only 4-5 species. Industry should invest in upgrading technology to ensure the use of other varieties of pulpable wood available, because a market has to be created for the wood expected to come from the JFM areas in future. Remunerative returns to the local communities involved in JFM has to be ensured, because the govrenment is committed to sharing revenue from the JFM produce with them. As to whether captive plantations meet the people's needs or not, the situation is piquant. The Karnataka government's agreement with MPL says that at least a part of the plantation should be under fodder and firewood. But when we visited the MPL plantation, we found that in reality, fodder and fuel were raised not on exclusive patches, but mixed with the general plantation. Due to competition from the fast-growing acacia or eucalyptus, the fodder and firewood could not survive, Thus; fodder and firewood yield is negligible. The MPL plantation has also negatively affected wood prices here. Competition for pulpwooded has somewhat increased prices of wood in general. But around the MPL plantations, prices were very depressed. While in Bangalore it is Rs 850 per tonne, in Shimoga, near the captive plantation, it is Rs 550 per torme. This shows that captive plantations really undermine the market and farmers do not get remunerative prices for their prodluqs. PIARELAL: I would like to clarify that it is not correct that wood-based pulp mills are not able to use less hardwood. In our own mill, we are using bamboo, eucalyptus, casuarina or mixed hardwood. But it is a fact that if a mill is designed for bagasse or cereal stalk it cannot use wood, and vice-versa. C H HANUMANTHA RAO: Conceptually speaking, however, the i&a of captive plantations goes against the spirit of liberalisation and marketisation. By the market, we understand a whole production system. I agree that there is much scope for improving the market system from what it is today. But captive plantations will totally kill the market and usurp all its functions. This is simply doing away with liberalisation. ANIL AGARWAL: Thank you very much. I think the debate has been held in the best spirit of democracy. I am really glad that all my friends came. I thank all of you.